Self-management education (SME) is a systematic intervention that involves active patient participation in self-monitoring (physiological processes) and/or decision making (managing). It recognizes that patient-provider collaboration and the enablement of problem-solving skills are crucial to the individual's ability for sustained self-care. All people with diabetes who are able should be taught how to self-manage their diabetes [Grade A, Level 1A]. Interventions that increase patient participation and collaboration in health care decision making should be used by providers [Grade B, Level 2]. Meta-analyses have demonstrated that SME is associated with clinically important benefits in persons with type 2 diabetes, such as reductions in glycated hemoglobin (A1C) of 0.36% to 0.81%. Improved quality of life (QOL) for persons with type 1/type 2 diabetes also has been demonstrated, as well as sustained weight loss and cardiovascular (CV) fitness for up to 4 years in those with type 2 diabetes. Diabetes SME is evolving from a traditional didactic teaching program to one using a variety of educational, psychological and behavioural interventions, and a combination of didactic, interactive and collaborative teaching methods that are tailored to the individual's specific needs. People with diabetes should be offered timely diabetes education that is tailored to enhance self-care practices and behaviours [Grade A, Level 1A]. The content and skill-training components of SME must be individualized according to the type of diabetes and recommended therapy, the patient's ability, barriers, motivation for learning and change, culture and literacy level, and available resources. Education sessions for patients have resulted in positive changes in diabetes-related knowledge, as well as psychological and behavioural domains. With respect to A1C, most trials involving group-based education have shown sustained A1C reductions (i.e. between 4 and 12 months), ranging from 0.4% to 0.7%. Basic knowledge and skill areas essential for SME are monitoring of relevant health parameters, healthy eating, physical activity, pharmacotherapy, prevention and management of hypo-/hyperglycemia, and prevention and surveillance of complications. Skill training should include using self-monitoring of blood glucose (SMBG), making appropriate dietary choices, incorporating an exercise regimen, using medications as recommended and adjusting medication. Culturally appropriate SME, which may include peer or lay educators, may be used to increase diabetes-related knowledge and self-care behaviours and to decrease A1C [Grade B, Level 2]. All trials evaluating a culturally appropriate SME (which incorporated cultural/religious beliefs, were offered in the patient's native language, adapted dietary advice to reflect cultural traditions/patient's needs, and/or involved family members) have noted improvements in diabetes-related knowledge, self-management behaviours and clinical outcomes, with A1C reductions ranging from 0.5% to 1.8%. Adding literacy- and numeracy-sensitive materials to a comprehensive diabetes management and education program may be used to improve knowledge, self-efficacy and A1C outcomes for patients with low literacy [Grade C, Level 3]. Training health care professionals in specific communication skills to address low literacy can also be effective. SME that incorporates cognitive-behavioural educational interventions, such as problem solving, goal setting, and self-monitoring of health parameters, should be implemented for all individuals with diabetes [Grade B, Level 2]. These interventions have been proven to be more effective in increasing knowledge, self-efficacy and self-care behaviours and in achieving metabolic control than programs that are didactic and knowledge oriented alone. A trusting, collaborative patient-health care professional relationship is important for improving self-care behaviours and adherence to recommendations. Frequent communication is a key indicator for successful interventions. In both type 1 and 2 diabetes, interventions that target families’ ability to cope with stress or diabetes-related conflict should be included in educational interventions when indicated [Grade B, Level 2]. Family- and culturally-tailored interventions are particularly relevant in minority communities. Several RCTs and systematic reviews have demonstrated that culturally competent healthcare interventions have resulted in lower A1C levels and improvements in diabetes-related knowledge and QOL. For people with type 2 diabetes, SME interventions should be offered in small group and/or one-on-one settings, since both may be effective [Grade A, Level 1A]. In general, group settings have been found to be more effective for weight loss and short-term glycemic control, whereas group interventions combined with individual follow-up sessions have resulted in lower A1C levels than either setting alone. Randomized control trials have concluded that different behavioural strategies are needed at different times to sustain behavior change in the long term. The availability of different technologies (e.g., the internet, web-based education, text messaging, email, automatic telephone reminders, telehealth/telephone education and reinforcement) has provided an effective and time-efficient means of enabling health care providers to offer continued self-management support between visits. Technologically-based home blood glucose monitoring systems may be integrated into SME interventions in order to improve glycemic control [Grade C, Level 3]. Peer facilitators may augment multidisciplinary team practices in providing SME and/or social support, especially when developed as culturally relevant behavioural interventions for underserved populations. The superiority of peer-delivered programs over similar programs delivered by health professionals has not been demonstrated in general populations with type 2 diabetes. No particular delivery strategy (e.g. video, web-based/online, phone, face-to-face, mixed) appears to result in consistently superior outcomes in persons with type 2 diabetes. A combination of didactic and interactive teaching methods, as well as group and individual sessions, appears to be most effective for persons with type 2 diabetes. Interventions that include face-to-face delivery, a cognitive-behavioural method and the practical application of content are more likely to improve glycemic control. The most effective behavioural interventions involve a patient-centred approach, shared decision making, the enablement of problem-solving skills and the use of action plans directed toward patient-chosen goals. Framework, Tools, Resources – steps involved in the promotion of SME. Five Elements that Promote Self-Management – infographic that shows how to discuss SME with patients. 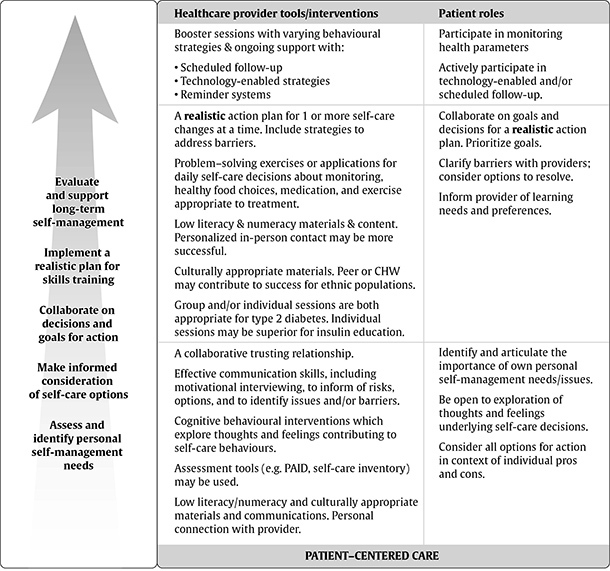 Quick Reference Guide: Promote Self-Management – what topics to discuss and how to collaborate with patients. If you would like more details on this topic, including references, please visit the Canadian Diabetes Association Clinical Practice Guidelines: Chapter 7.